Why can you climb Ojos del Salado so quickly in comparison to Aconcagua? What can I expect on summit day? Do I have to carry heavy packs during the climb? Do I need a permit to climb Ojos del Salado? What is the advantage of climbing Ojos and Aconcagua in the same trip? 1. Why can you climb Ojos del Salado so quickly in comparison to Aconcagua? Ojos is a very different mountain than Aconcagua. Ojos is located in the desert of Atacama, in a very remote place and the camp sites are located far apart from one another. We use 4-wheel drive vehicles to transport our gear and ourselves to our first camps. In our initial days, we hike from our beautiful and remote base camps which are stocked by 4-wheel drive. 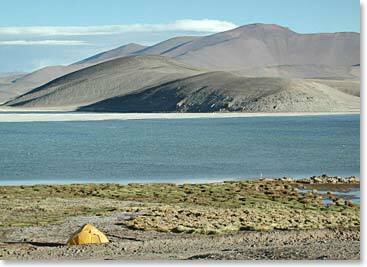 The altitudes are significant, but we will take our time to acclimatize by enjoying this vast and beautiful region. 2. What can I expect on summit day? The summit day for Ojos is long, but it is a beautiful and wild ascent, much more lonely and remote than an Aconcagua summit day. We will spend our night before our summit at high camp (19,000ft/5,800m) and move slowly on some easy rock and scree until we reach the glacier. Some years we climb above the glacier and ascend all the way without crampons. Sometimes we cross the glacier. In either case the climbing is moderate and takes determination, not a great deal of climbing skill. The final section that leads right to the summit is an easy rock climb. We will belay each member up the enjoyable low fifth-class climbing to the very top. 3. What kind of physical condition do I need to be in? Ojos requires endurance and good physical condition. The sooner you begin to train the better. We have climbed this mountain with people aged 19 to 79, but anyone who expects a reasonable chance of reaching the top of these mountains must be prepared to be tough mentally and to have a reasonable base level of aerobic fitness. 4. Do I have to carry heavy packs during the climb? You won’t need to carry heavy loads up and down Ojos del Salado. You will have vehicle support to assist in stocking all the camps except high camp. Our staff will carry tents, food, fuel, and all climbing gear on both mountains. 5. How heavy will my pack be? Most days you will have only a day pack that will weigh around 20lbs/9kgs. When you move to high camp you will need to bring your overnight gear. Even so, your pack will likely weigh less than 40lbs/18kgs. 6. What kind of prior climbing experience do I need to have? We recommend that you have been to high altitude on a previous trip such as Everest Base Camp or Kilimanjaro. You might wear crampons and use an ice axe on summit day. Prior experience with basic alpine snow and glacier travel is helpful, but not required. We approach this expedition as a learning experience. Your guides will be offering instruction and will monitor your condition constantly. 7. Will I be sharing a tent or a room with anyone? The trip cost includes hotels and tents on a double occupancy basis. We do offer the option of a single room supplement. If you are traveling alone but want to occupy a double room, we will do our best to find a roommate of the same gender for you. In the event that we cannot find a roommate for you, you will be charged half of the single supplement cost. 8. What kind of food do you have on the mountain? Our menus are varied, and we use fresh wholesome ingredients. There are always fresh soups for dinner, plenty of vegetables as well as good meats served separately so that vegetarians have a choice. In addition to full breakfasts (eggs, toast, fresh fruit, hot and cold cereal), our lunches are complete and we offer an array of snack food. Tea time with herbal teas, fruit drinks, coffee and hot chocolate, popcorn and cookies are a regular afternoon tradition that is always appreciated. 9. What types of communication are available on the climb? 10. Do I need a permit to climb Ojos del Salado? 11. What kind of camera should I bring? A camera that you are familiar with will be better than one you are learning to use. Small point-and-shoot cameras will always be useful because they can stay handy in your pocket. However, inexpensive point and shoots can become unreliable in cold temperatures and dusty conditions. Look for one that is simple, rugged and well-sealed. Look for a camera that is portable enough to be transported easily, yet not so small that controls will be difficult to work with gloves on or with cold fingers. Rugged Digital SLR cameras offer the flexibility of interchangeable lenses and normally perform better in extreme conditions. Even though they are heavier, they are worth bringing if you have experience using them. Also bring plenty of memory cards. Many people underestimate how many pictures they will take! 12. What is the advantage of climbing Ojos and Aconcagua in the same trip? Ask around and you will find plenty of accounts to confirm that the success rate on Aconcagua is not that high. We have had outstanding results with this approach; by beginning on Ojos you will greatly improve your chances of performing well on Aconcagua and you will experience traveling and climbing in two unique and contrasting areas of the Andes.